boiled chicken. Both cooked at home in Mumbai. Note: If all you want is the recipe, then please scroll straight to the bottom of the post. I hope you will not do so though. Food mementos are my favourite souvenirs to get back from my travels. Take for example my recent trip to Mangalore from which I came back with a load of spice and chutney mixes, flours, jackfruit papads and condiments from Dharma Prakash Mills, a 94 year old shop there. That's Avinash, the grandson of the founder in the picture below. Surprisingly, I didn't have to pay for excess baggage on my flight back despite all my purchases. 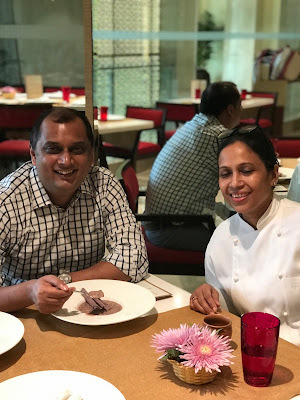 I was taken to Dharma Prakash Mills by Shriya and Varun Shetty, readers who had connected with me through Instagram and with whom I caught up for a coffee at the Diesel Cafe and where I listened to their dreams of introducing a more modern dining format in Mangalore and which would be rooted in the local culinary tradition. They then took me to the Flower Market and suggested I buy jasmine hand bands for the ladies in a house I was invited for dinner that night instead of mundane bouquets that I had wanted to buy. Mogra lower shopping done, they took me to the flour mill and pointed out lots of stuff that I could buy to take back home. 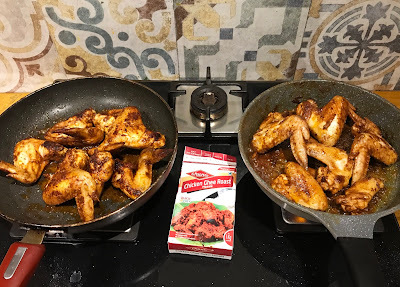 I have used the ghee roast masala from the shop so far and made chicken wings with them when friends dropped in home the other night for the pork baffad that I had got back from the Mangala Bar and Restaurant in Mangalore and the gudgud alambe mushrooms too. find in Mangalore where they seem to 'ghee roast' every thing! Our earlier exposure to baffad was at Britto's in Goa. They make a version with prawns where the curry is a coconut milk based one and reminds us of the Bengali prawn malai curry. The pork bafad at Mangala, the Mangalorean version of the dish, turned out to be very different. The cubes of pork in it was incredibly soft and the gravy thick and with a visibly high whole garam masala quotient. It almost seemed like a cross between a sorpotel and a vindaloo. You get the sorpotel and vindaloo in one kilo frozen blocks and Keerthi and Arrol, who own the restaurant, most kindly insisted that I take back a pack of bafad when I wanted to pack a portion for K. I carried it in my checked in baggage and then called Kurush and Rhea, who I knew would love it, and then slowly thawed it in a pan on the hob couple of nights after I had returned to Mumbai. The baffad, like the vindalho and the sorpotel, is one of the dishes that are of Portuguese origin (baffado) and have been adopted by the Mangalorean, Goan and East Indian Roman Catholic communities of India. They were of course converted to Christianity by the Portuguese ages back. Each community and each grandma within each add their own touch to these dishes. The gudgud alambe mushrooms are available for just a week after the first rains and grow in the cracks that appear in the soil that in the forest land around Mangalore when the rains hit them. They are then foraged and sold. Each mushroom has to be peeled and then eaten. They require minimal time for heating. These were packed for us by Shobha and Girish Kamath. Shobha had prepared these for dinner for us in a mellow onion flavoured coconut gravy. Back in Bandra, we just heated the mushrooms and had them and enjoyed their flavours in their full glory. The raw mushrooms in the picture below are from a shop just outside the Shri Krishna Matha in Udupi. Gudgud means thunder as Dr Pradeep Rao told me. Not quite wild boar, but by Toutatis it works! 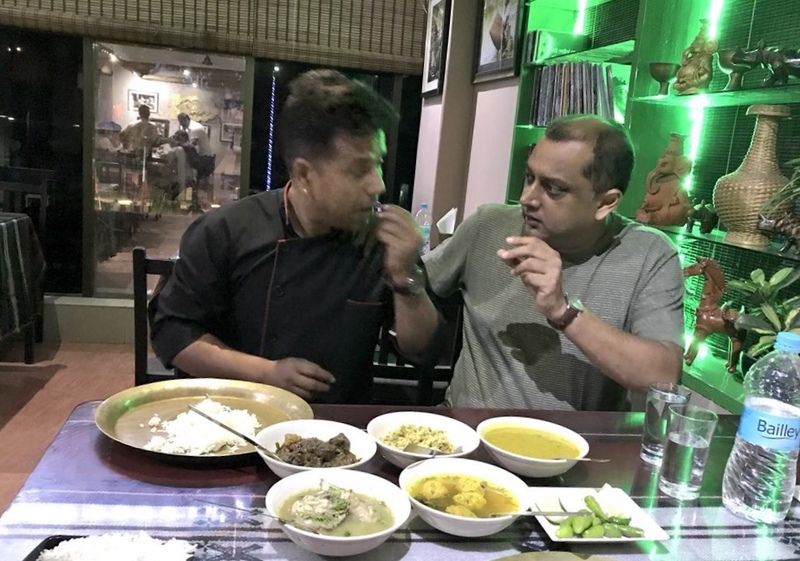 This post traces its origins to Assam though and is about another type of food memento that I love. I am talking of instances when I come back home and recreate recipes based on memories of dishes that I have had during my travels. This is something that I have been doing for years. 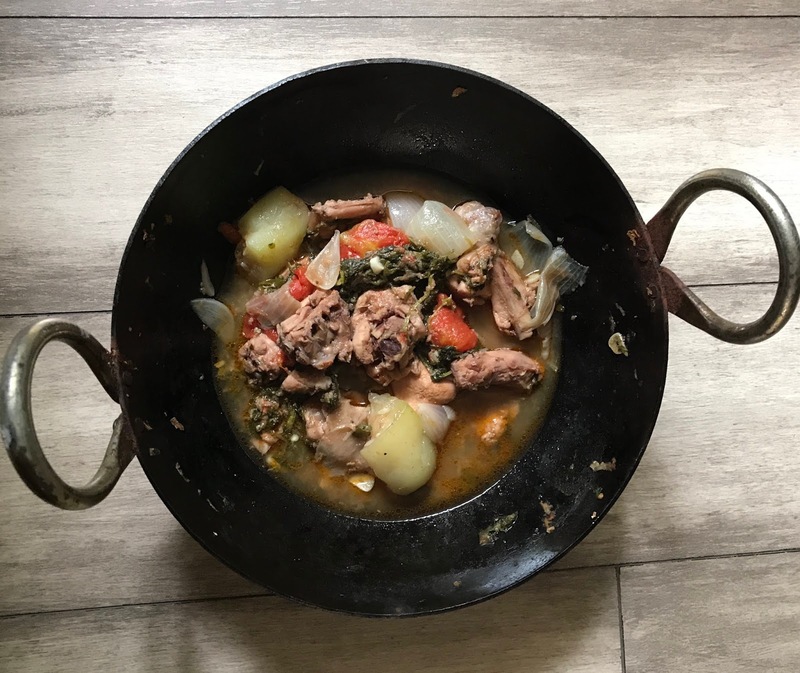 I made a chicken stew/ curry with no oil for my lunch yesterday. The dish was inspired by a flavourful dish that I had eaten at Chef Atul Lahkar's Khorikaa Heritage Restaurant in Guwahati. During my dinner at his restaurant, the smiling chef had explained to me that he uses a variety of cooking techniques in his kitchen. Techniques which are inspired by what he sees during his travels across the state of Assam. The dish in question is what he had loosely referred to as boiled chicken from rural Assam. This is a light and fragrant chicken dish, white in colour. The gravy had a distinct garlic note in it which balanced and blended beautifully the meatiness of the chicken and the herbs used in the dish. full after the momos at Chinese Hut. I am so glad that he had done so! The preparation reminded me a lot of the chicken 'stew' that my mother made us when we were kids and which I often make at home now in a pressure cooker. We would also get this this stew at the small cabin outside the College Square swimming pool in Calcutta. This is when I was in Presidency College and when we would often go and stand outside the tiny cabin and fill our tummy with a bowl of the stew and a small loaf of bread. We would opt for the vegetable stew which had papaya, potatoes, carrots, onions and beans in it. This would cost around Rs 3 (yes, three) in 1992 -95 if I remember right. The chicken stew was beyond our reach and cost Rs 5. We didn't really get a separate spending allowance and this money would come out whatever one would save from the travel allowance our parents would give us. Gautam Bhattacharya had recently written on Facebook about how one would get this stew at the grounds of the football clubs of Kolkata in the Maidan there. I decided to make the boiled chicken yesterday after Babita Baruah, a friend of ours who works in an advertising agency and is based in Gurugram, sent me packs of black rice. Black rice is indigenous to Manipur. What she had sent was grown in Jorhat in upper Assam though, by her nephew and niece, Supriya Bordoloi and Manisha Dutta. They run a company called Agrorganic where they retail produce from their farms. A quick Internet search told me that black rice was referred to 'royal rice' in the past in China as it was reserved for the royalty. It was also called 'Forbidden Rice' because commoners were not allowed to eat it during the rule of the Ming and Ching dynasties in China. This is because it was believed to aid the longevity of ones life and was hence reserved for the royals. 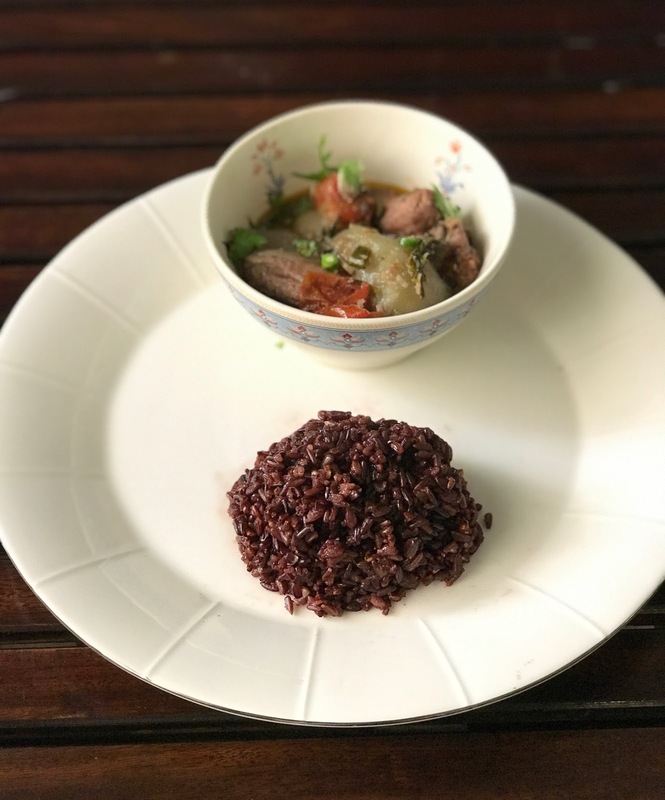 Black rice does not undergo any refining or processing from what I understand and is hence said to be rich in fibre, has a much lower GI than white rice and is rich in antioxidants too. Today commoners can have it too. Provided one can access it! The first time I had black rice was in the payokh (rice pudding/ payesh/ kheer) that Kashmiri Nath had made in her Assamese food pop up in the Trident BKC. I am not sure if black rice is consumed commonly in Assam or at least in Guwahati. Possibly not, if one goes by whatever limited experience I had there. However, it sure is an important part of the rich bounty of nature that the north east of India is blessed with. The beauty of which, those of us in the rest of India are just beginning to learn. Babita's suggestion to me was to have the rice with either a dry dish or with a light broth and not with a heavy curry or even a dal. She said that the colour comes out from the rice when mixed with anything liquid on the plate and this looks rather unpleasant and hence it is best not to pair it with a curry or dal which has its own distinct colour. She also said that the rice has a distinct nutty taste of its own and should not be combined with something whose taste clashes with that of the rice. Babita. suggested doing a green chili version of the bhoot jholakia chicken where chicken is boiled with ginger, garlic, salt, bamboo shoots (at times) and the fiery bhoot jholakia chillies. She suggested using chopped green chillies instead which worked for me as I can't handle dishes which are too hot and I stay away from the likes of the fiery bhoot jholakia. I had also seen food blogger Sanjukta Dutta, whom I had met for breakfast while at Guwahati, post a picture of a dish similar to that of Atul's on her blog. I looked up her post of the boiled chicken and saw that one difference from the stew that we make at home is that she had added a lot of coriander leaves in it. She had slow cooked the chicken in a wok with onion, ginger and garlic, tomatoes, potatoes and vegetables such as ash gourd and squash. This was another difference from the way I make my stew as I use a pressure cooker. The amount of water added in hers seemed to be less than mine too. I decided to make a version of Sanjukta's boiled chicken at home to go with the black rice. I used poultry while she had used country chicken. Chicken on the bone (500 g), diced onions and tomatoes (1 each), finely chopped fresh ginger and garlic (amounting to 1 tablespoon in total), 1/2 a bottle gourd (lauki/ lau) peeled and cubed into large pieces, 2 finely chopped green chillies, a handful of freshly chopped coriander leaves, 1 teaspoon of salt, I skipped the potatoes and crushed black pepper but you can add both. No oil is needed. You can reduce chicken to 300 g and add more vegetables if you want to. Add the ingredients to a heated (I used my cast iron wok) wok and gently stir the contents. The chicken releases a bit of its natural juices so you jut need to add half a coffee mug of water to this after a few minutes. Cover the wok with a lid and let it simmer on a low flame for half an hour, at the end of which the stew will be read ready. While no oil is added to the dish, the fat released from the chicken adds a beautiful glaze on the surface of the curry. The curry was intensely flavoured despite the simplicity of the ingredients. A true example of the benefits of slow cooking. This tasted a lot more robust than the chicken stew that I make AND I have never enjoyed lau so much in my life. To give context, this is a vegetable I have hated all my life and have only recently begun to allow on my plate. This one, I loved! I kept some of the boiled chicken for K to have at night and she couldn't stop raving about it and asked me to make it for her again. The chicken was not overcooked at all and I strongly feel that slow cooking the chicken and adding very little water to it is what added intensity to the flavour. The addition of fresh coriander helped. I remember Sisir telling me that they hardly use oil or spices in their food in Assam. The boiled chicken showed me that it did not need it. The Internet suggests soaking black rice overnight as the rice takes a long time to cook. I soaked it for an hour and then boiled it in lots of water. The water turned black but unlike red rice which turns white eventually, this remained black till the end. The rice took around half an hour or so to cook on a moderate flame and I drained out the excess water at the end. The rice felt a bit sticky and stuck to each other when done. The taste was nutty indeed and was quite distinct from the white rice or even red rice that one eats, and had a lot of character. The ideal way to enjoy the combination is to have a bite of the chicken stew and then the rice and enjoy the flavours of each and make it a complete meal. Black rice after all, is not like white rice which often just offers a foil for the curry with which it was mixed. This is a rice with a personality of its own. I like the texture. It was chewy and yet wasn't tiresome. I could see this rice become a part of my repertoire and all thanks to Babita and the folks at Agrorganic who sent it to me. So my lunch in Mumbai yesterday had flavours drawn in from Assam and Manipur and which were brought together by a Bengali. A true case of national integration in the kitchen! I am so happy that what I call my #LittleJackHornerMeals , meals which are aimed at making me eat healthier, is making me experiment so much in the kitchen and thereby come up with lovely additions to our repertoire. This lunch was even more special as it drew on what I have learnt through my recent travels within the country. It owed its existence to the wonderful people that I have met during my travels, friends I have made during this journey. The meal left me satiated and yet hungry for more...for discovering more wonderful dishes from across the world and, more importantly, from across our country and I know that this is just the beginning. 3. My post on what the #LittleJackHornerMeals are all about. 6. Here's where you can purchase my book, The Travelling Belly, which has tales of my eating my way across the country.